PASADENA, Calif.—Do you change the oil yourself for your car or truck? 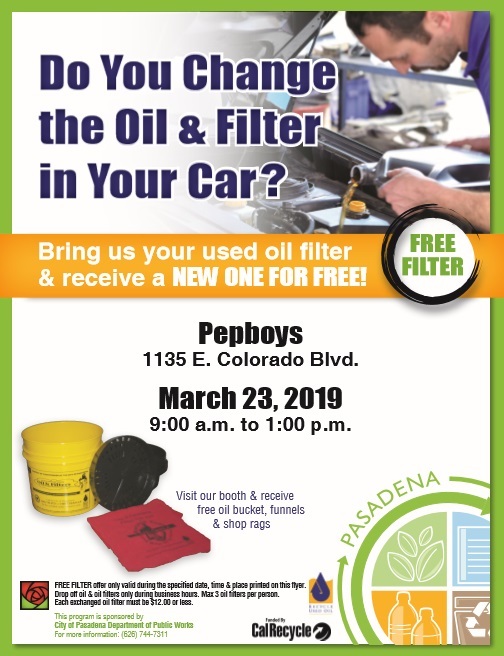 All Pasadena do-it-yourselfers are invited to safely recycle both their used oil and oil filters—and get a new oil filter for free—from 9 a.m. to 1 p.m. Saturday, March 23, at Pepboys, 1135 East Colorado Blvd. Just bring your used oil filter and get a free new oil filter, limited to three (3) per person. Free oil recycling kits will also be provided to attendees. Oil filter exchange events help protect the environment by promoting proper recycling of used oil and oil filters. We encourage residents to bring their used oil to the events as well. If you would like your used oil picked up directly from your residence, please schedule an appointment by contacting the Pasadena Citizen Service Center at (626) 744-7311. A list of certified oil and oil filter collection centers located in Pasadena is available online. Pasadena’s oil filter exchange events are made possible by a grant from the California Department of Resources, Recycling and Recovery (CalRecycle).